With Halloween just around the corner, a whole slew of kiddie costume kits have already emerged at our local Dollar store. But this caught my eye. 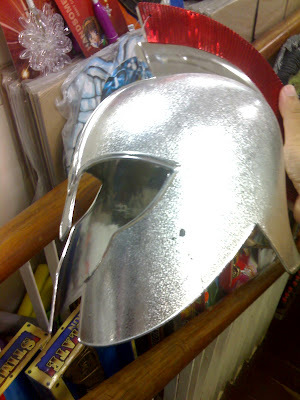 Looks like a Spartan's helmet! Kids are gonna wear this? Will their folks even let them? I gotta say you'd have to be one buff 6 year-old to look the part. I can already see it. Lil' kids kicking other kids into open manholes, or ditches while screaming "THIS IS SPAAARRRTAAAHHH!!!" It didn't have a box, or instructions. Hell, it was missing a cape, shield, and a spear, too. 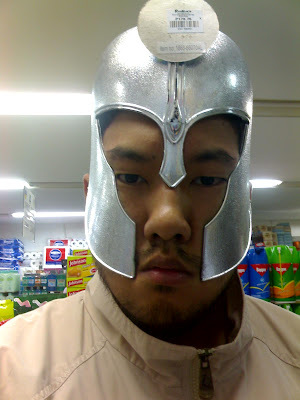 I've always thought you would pass a Genghis Khan audition. I know a few head shrinking techniques.